Thank you to Zonderkidz for sponsoring this White Chocolate Peppermint Popcorn post to celebrate The Berenstain Bears and the Joy of Giving children’s book! 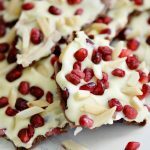 This white chocolate peppermint popcorn is a no bake holiday snack that kids will love to help make and share with others! 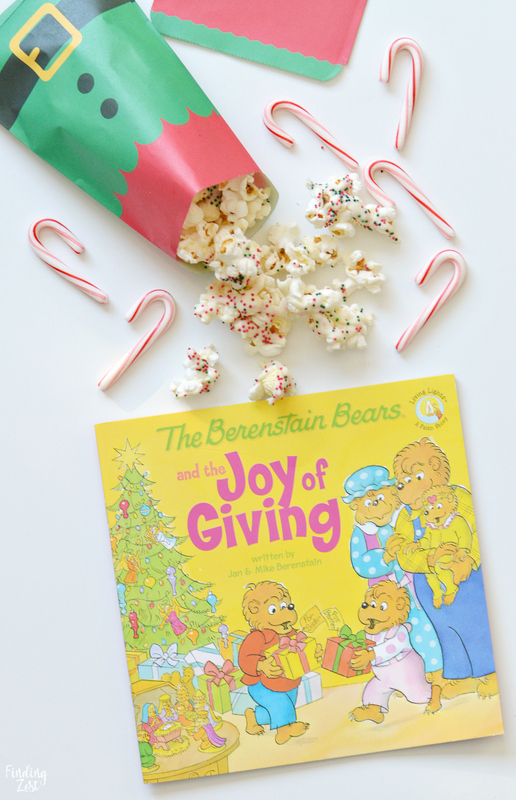 This tasty popcorn treat was inspired by The Berenstain Bears and the Joy of Giving children’s book and is perfect for gift giving. 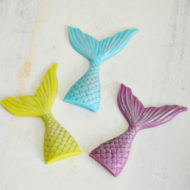 Package it in fun treat bags for your child to gift to friends, family and neighbors! I love reading books with my children that feature characters that I enjoyed as a child. 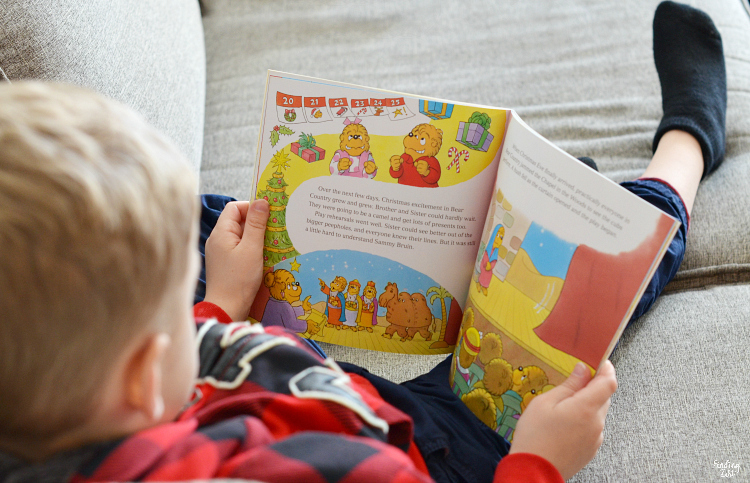 The Berenstain Bears are a classic example of characters that keep on living through generations of families. I really loved reading about the adventures of Brother and Sister Bear when I was little and am thankful that I can continue this tradition with my own sons. 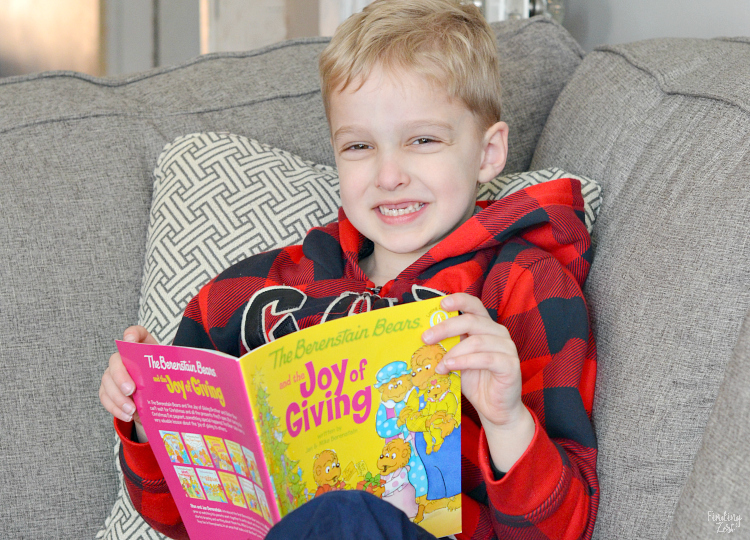 The Berenstain Bears and the Joy of Giving is a great holiday addition to our book shelf. In The Berenstain Bears and the Joy of Giving, Brother and Sister Bear can’t wait for Christmas and all the presents they’ll open. 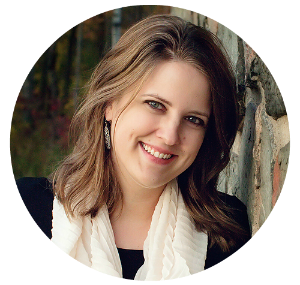 But during the Christmas Eve pageant, something special happens! The Bear cubs learn a very valuable lesson about the joy of giving to others. Wesley might be only in first grade, but he is an advanced reader and loves reading books on his own. How has he grown up so fast? We cuddled up on the couch and enjoyed this book together the first time. I appreciate books with a strong message to kids and this one really promotes the importance of giving instead of focusing on receiving. Giving to others truly is what makes the holiday season so special and I like having a book that helps drive that message home. Keep in mind that this book is not secular and comes from a Christian point of view. Inspired by the message of the book, we made an easy white chocolate drizzled popcorn recipe that is perfect for gift giving! 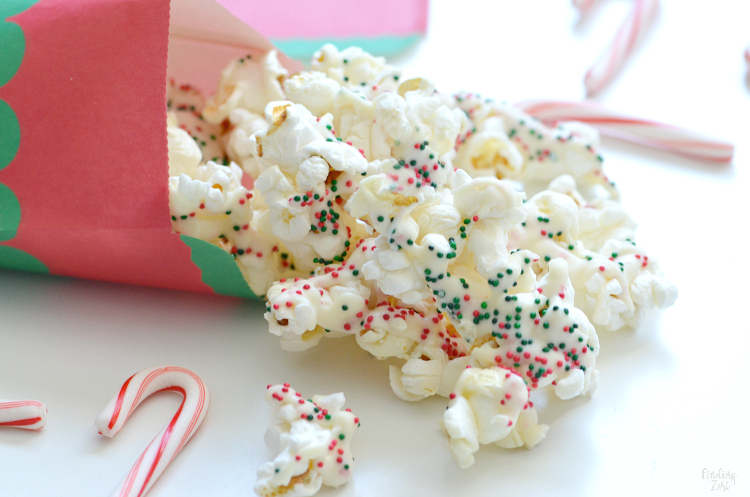 To make this easy white chocolate peppermint popcorn you’ll need just two key ingredients. Use your favorite popcorn for the base of your recipe. 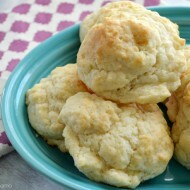 This can be made in an airpopper, microwave or you can simply purchase a bag of already popped popcorn. 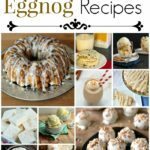 I purchased a bag of popcorn that was already salted and very lightly buttered to make this peppermint popcorn recipe even easier. 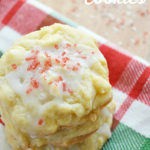 For the white chocolate peppermint drizzle, I used peppermint chunks baking chips. For a more festive look, I sprinkled nonpareils in red and green to match the Christmas season. This white chocolate popcorn takes less than 5 minutes to make. Simply spread your popcorn out in a single layer on a large baking sheet lined with a silicone baking sheet, parchment paper or aluminum foil. Melt your peppermint baking chunk the microwave in intervals, stirring often until melted. Kitchen Tip: Use a glass measuring cup for easy drizzling! 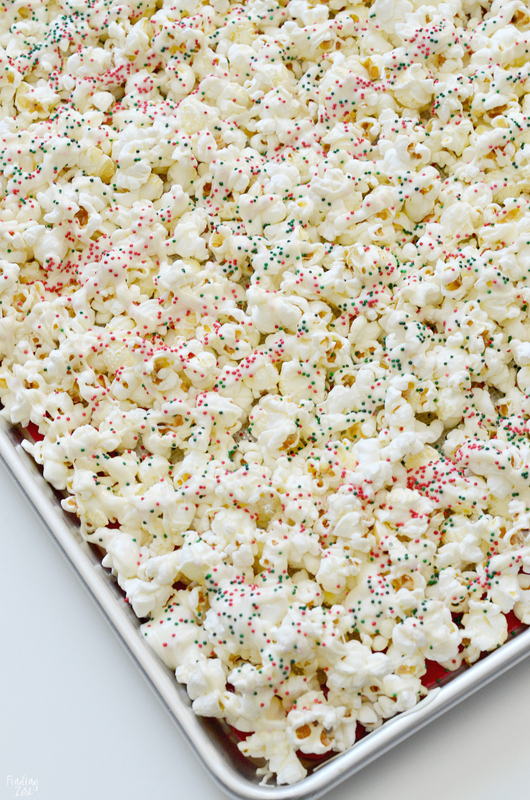 Pour the melted peppermint chunks over your popcorn, being careful to add chocolate drizzle evenly. 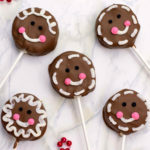 Immediately sprinkle with your nonpareils and let sit at room temperature until chocolate hardens. 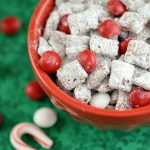 This white chocolate peppermint popcorn is a no bake holiday snack that kids will love to help make in celebration of The Berenstain Bears and the Joy of Giving children's book! 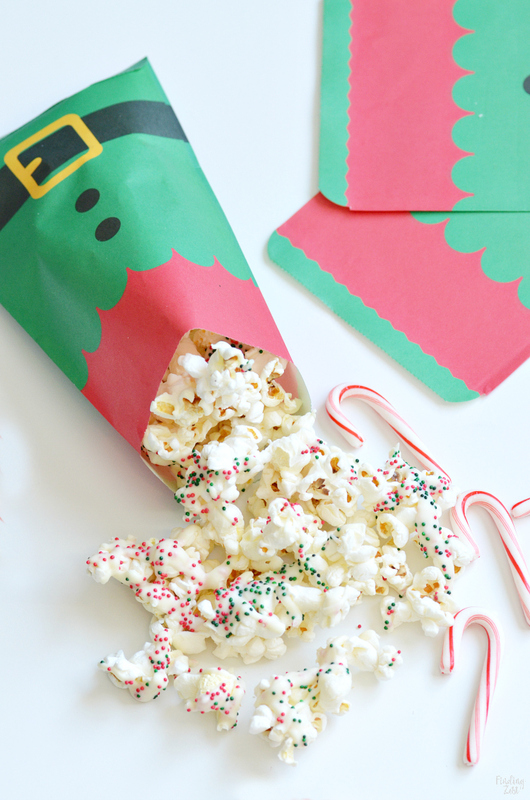 This tasty popcorn treat is perfect for gift giving and only requires three ingredients. 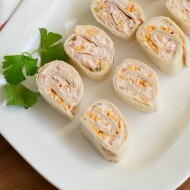 Line large baking sheet with silcone baking mat, parchment paper or aluminum foil. 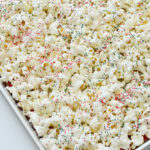 Spread popcorn out in a single layer on baking sheet. Place baking chips in 2 cup (or larger) glass measuring cup. 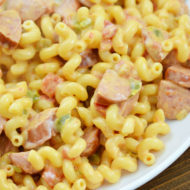 Microwave in short intervals, stirring often, just until melted. 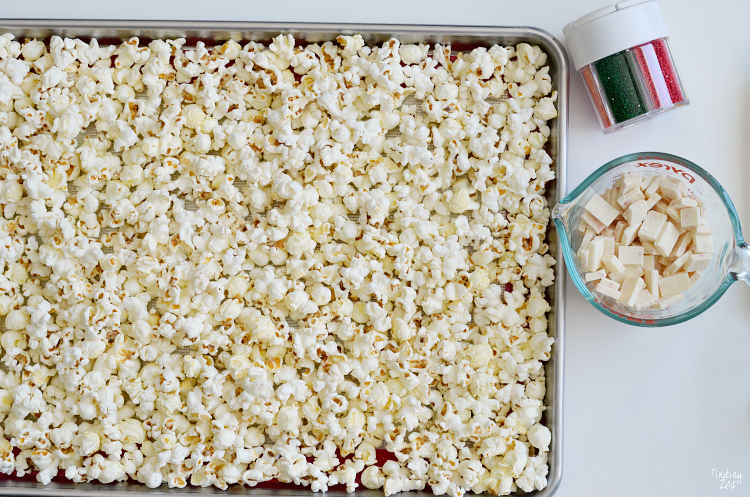 Drizzle melted white chocolate evenly over popcorn. Sprinkle with nonpareils, if desired. Let stand at room temperature until chocolate has hardened. Store in air tight container. To experience the joy of giving, fill fun treat bags with the white chocolate peppermint popcorn, making sure to seal for freshness. 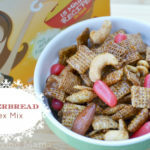 Your child will feel so good sharing this tasty sweet and salty snack with others and will feel a sense of accomplishment if they helped to make it! 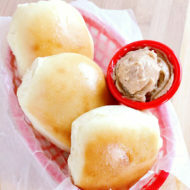 Deliver your tasty treat to friends, loved ones, or neighbors- wherever you want to spread holiday cheer! 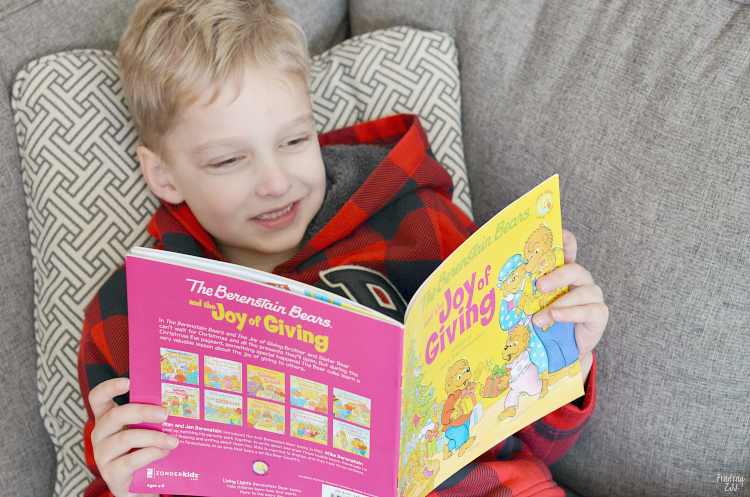 Be sure to pick up your copy of The Berenstain Bears and the Joy of Giving to share with your child this Christmas season! You can find it at retailers nationwide, including Amazon.